(Bloomberg) -- Lyft Inc. went public Friday in the highest-profile stock sale of the year. It didn’t take long for the doubters to show up in the equity market. The shares dropped as much as 12 percent to $69.12 as of 10:32 a.m. in New York, more than erasing Friday’s gain and falling below its initial public offering price of $72. Wall Street analysts highlighted concerns about how fast the ride-sharing company can start making money. While Lyft’s rapidly growing revenue and a large and mostly untapped potential market has many fans, the latest analysts starting their coverage on the stock also noted a possibility of growth slowing down. “Following years of significant improvement, we believe market share gains and revenue growth are poised to slow as competitive pressures mount in the ride-sharing industry,” Consumer Edge Research analyst Derek Glynn wrote in a note to clients. 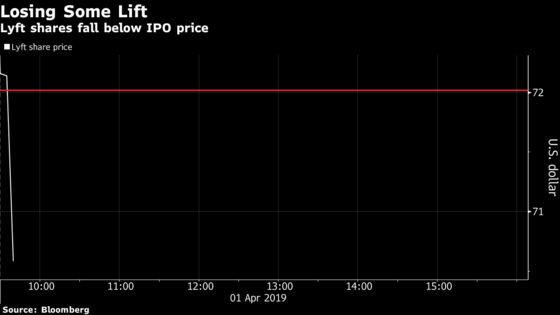 The analyst initiated coverage on Lyft with an equivalent of hold rating and a $73 price target, compared with the average price target of $77.74, according to data compiled by Bloomberg. Volatility during the first few days after an IPO is not unusual, and may not always be a good indicator of where the company’s valuation might settle after the initial euphoria. However, on an average over a longer term, they seem to be fairly accurate. While Lyft’s IPO was a much hyped affair, skeptics had sounded warnings earlier, even though investors did not seem to mind that the company was losing money. Lyft disclosed in its IPO filing with the Securities and Exchange Commission that it lost $911 million on revenue of $2.2 billion in 2018, compared with a loss of $688 million on revenue of $1.1 billion the previous year. Berkshire Hathaway Inc.’s Warren Buffett expressed his reluctance in a CNBC interview on Thursday, saying he “certainly wouldn’t buy a business for $25 billion.” Wedbush analyst Daniel Ives last week noted that it was “hard to be bullish” on the stock above $80.